Colliers International announces that it has been appointed by FID Group as the Property Manager of Slovanský Dům and by B.H.Centrum a.s. as the Property Manager of Millennium which forms part of the complex including the Marriott Hotel. Both buildings are prime mixed-use properties situated in the heart of Prague’s CBD. Slovanský Dům offers facilities of the highest standard. 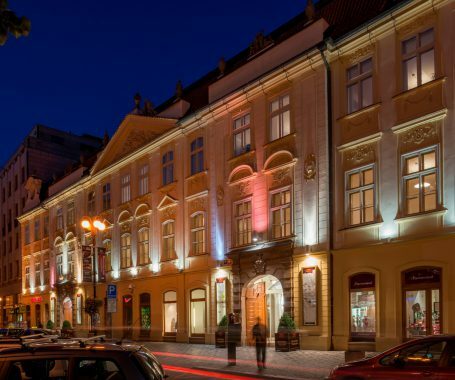 The property is located on Prague’s prime shopping street, Na Příkopě, and comprises a blend of historic and new buildings offering office, retail, gastro, leisure, conference / ball room, underground parking and residential apartments, totalling ca. 22,500 square metres. Moreover, Slovanský Dům offers a tranquil green space in the city centre in the form of a mature courtyard garden unrivalled by any other project in Prague. The exclusivity of the building complex is illustrated by the list of tenants, including A.T. Kearney, Bloomberg, Ipsos, Panattoni, Cinema City, Emirates, Kogo, Max Mara and Nike. “The possibility of managing this prestigious complex is a great honour for Colliers. We realize the essential role that Slovanský Dům plays as a place of work and leisure for people in Prague, so we are committed to ensuring that both occupiers and visitors receive the highest level of care,” said Omar Sattar, Managing Director, Czech Republic at Colliers International. Colliers International took over the property management of Slovanský Dům from CBRE on March 1, 2017. Colliers are undertaking the management in combination with SB Property Services who are providing operation support and expertise. Millennium is a modern commercial development which includes a carefully integrated part of a historic building, located at the corner of V Celnici and Havlíčkova Streets. As a true central location, Millennium guarantees easy access by car, metro, tram and train. Comprising some 66,000 square meters GLA, Millennium features offices, retail, entertainment facilities, underground parking, alongside the hotel accommodation and conference facilities in the five star Marriott hotel. “We are very pleased to be involved in this project, particularly now when this part of Prague 1 is in the spotlight. The revitalization of the immediate vicinity and new projects are transforming it into an extension of the core CBD,” commented Iva Cankova, Director of Office Agency, Czech Republic at Colliers International. Colliers International took over the property management of Millennium on April 1, 2017.